Small items such as lamps and side tables will be shipped as a parcel. You will receive a tracking code to follow it’s progress. Large items are delivered by a specialized carrier. An appointment will be made for a suitable delivery day. With the exception of the Wadden Islands. Hidden cabinets and lamps are not mounted on walls or ceilings. These rates are only applicable for consumer delivery on ground level. 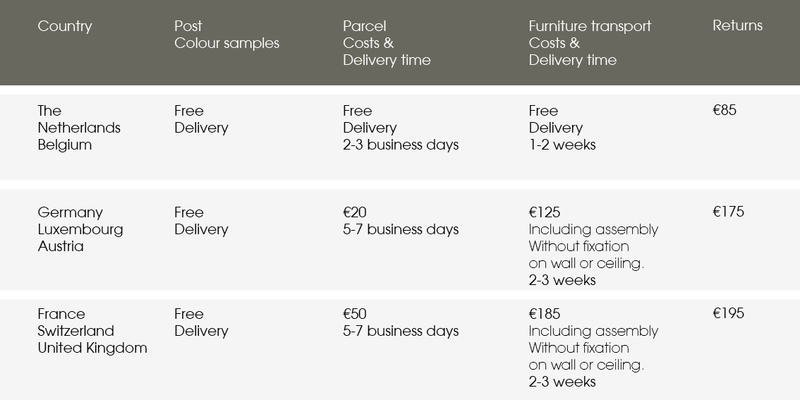 Floor deliveries cost €25,- extra, it is assumed that products fit through stairwell or elevator. When in doubt, please contact us for advice. For small items returns the shipping costs are the customers responsibility. Small items can be returned with any parcel service of your own choosing. Large items can be returned for the rates in the table below. Please contact us for shipping costs to other countries.